You raised your kids. You spoon-fed them applesauce, taught them how to tie their shoes, and somehow got through those pesky teenage years. But now, the birdies have flown the nest and your home is kidless, quieter, and most likely cleaner too. Entering your empty nester days can be equal parts nostalgic and relieving, but one thing your foray into the world of kidless-ness shouldn’t be is stressful. 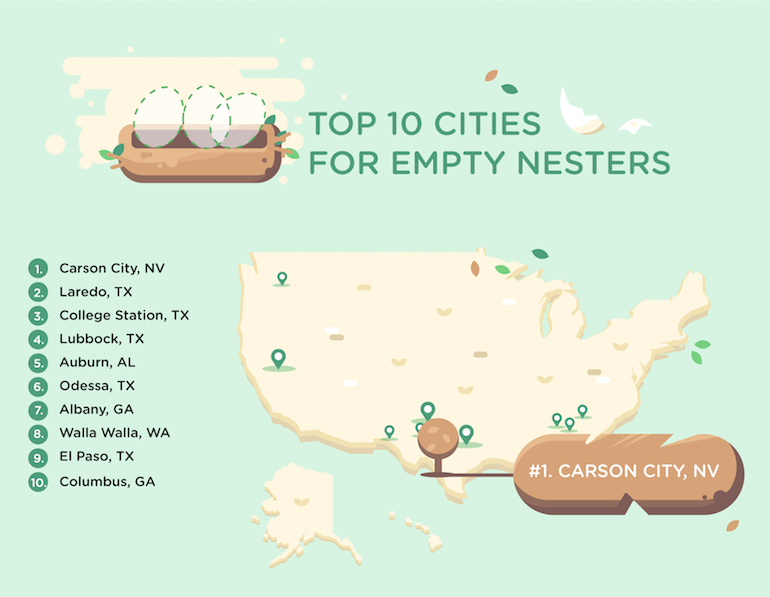 We researched the best places for empty nesters to move to, so whether you’re looking to downsize or move somewhere warmer, we have the 411 on which cities rank highest. *Categorized by states that don’t tax social security benefits. On the cusp of the California-Nevada border sits Carson City, Nevada—home to the Sierra Nevada mountains, lots of outdoor activities, and a strong sense of community. All that, combined with its feasible housing costs, makes it easy to see why so many people flock here each year. 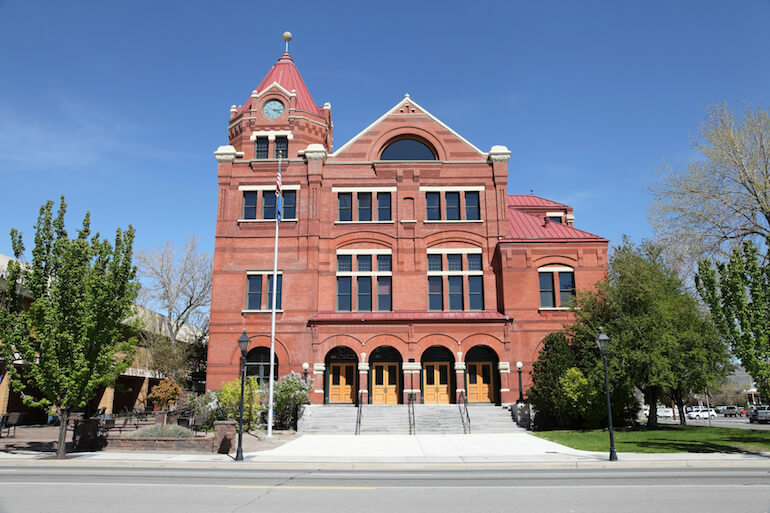 Plus, Carson City is only a twenty-minute drive from Lake Tahoe, which hosts winter and summer attractions alike. This year, the kids can come to you for the holidays. Big city meets small town in Laredo, Texas. With annual rent and utilities in the 600s, Laredo has the cheapest rent and utility rates on our list. 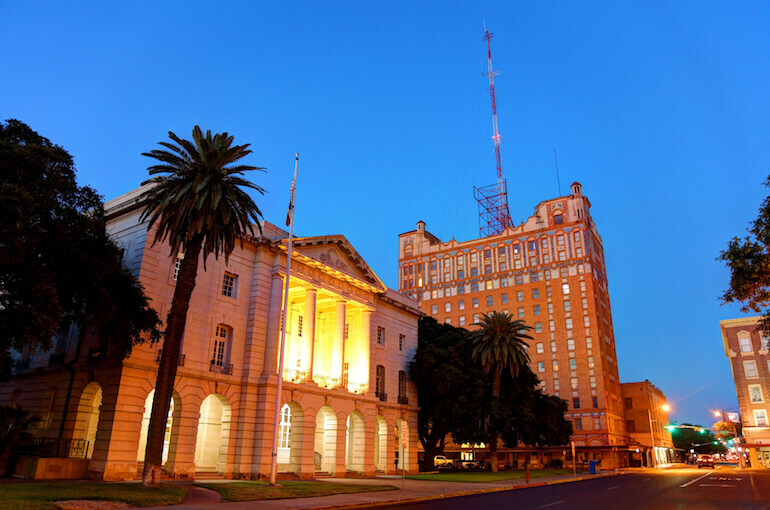 That, coupled with it being a hop, skip, and a jump away from the Laredo International Airport, make this Mexico-Texas border city worth considering. And if its mild winters aren’t reason enough to make your way down south, we’re confident Laredo’s famous Mexican food scene will do the trick. 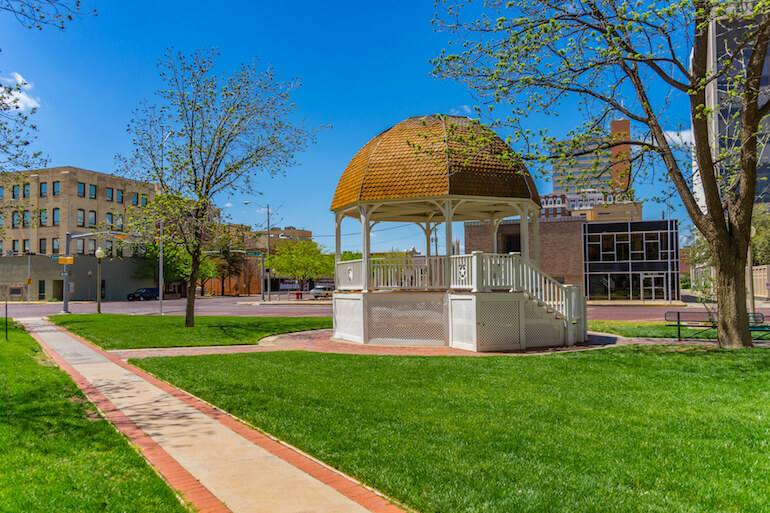 As the tenth-largest city in Texas, Lubbock is no cow town. 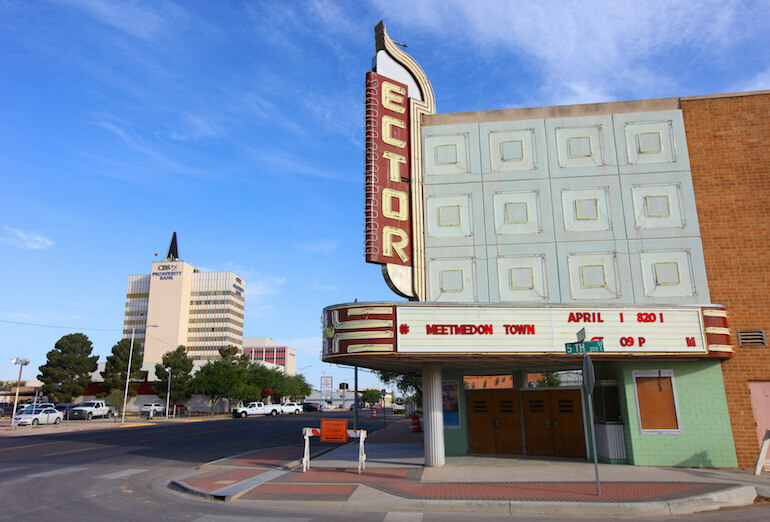 But even with a thriving small business scene and two universities to cheer on, this west Texas jewel hasn’t sacrificed its tight-knit neighborly feel. 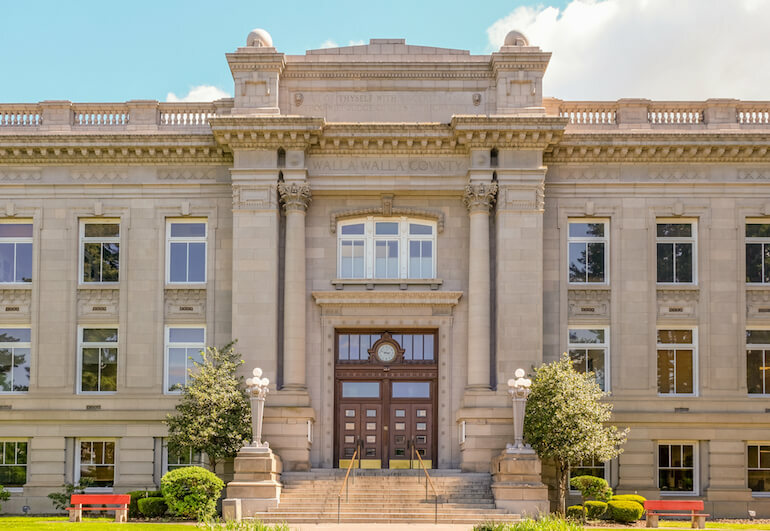 With countless museums to peruse and the first commercially run winery post-prohibition to check out, you won’t have trouble entertaining yourself (or your family). 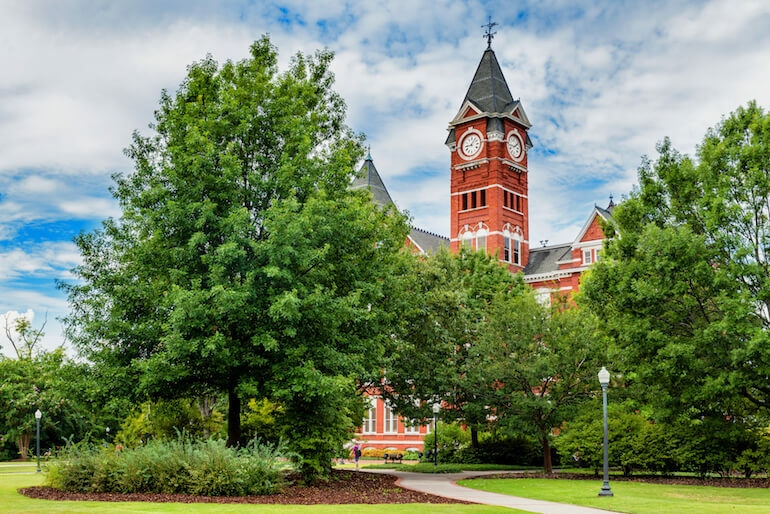 If you’re even thinking of living in this city, get to know Auburn University’s fight song. As far as towns big on football go, this one’s front row. But if football isn’t your forte, Auburn has farmers markets, picturesque Chewacla State Park, and tons of local breweries to boast. 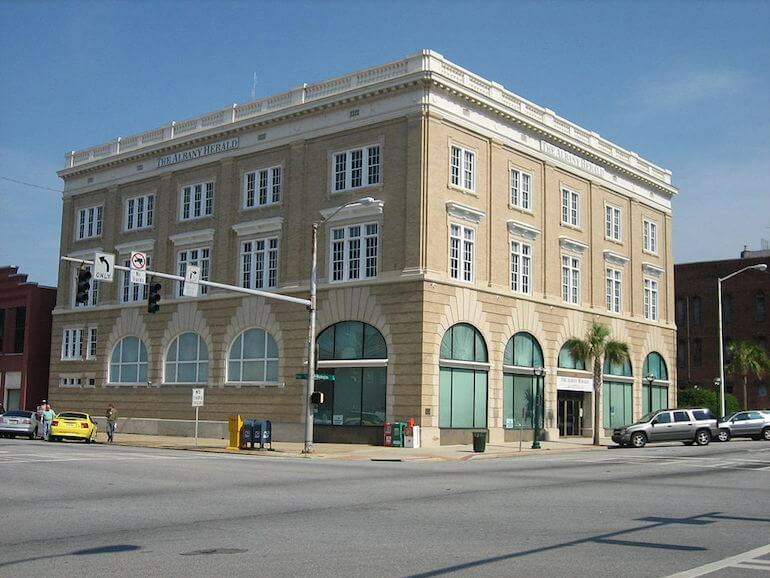 Plus, we like how tax-friendly Alabama is for its retirees. Homeowners over age sixty-five don’t have to pay state property taxes, and the Southern state doesn’t tax social security benefits either. Two words: Jackrabbit Jamboree. Celebrating the spirit of the large population of hares that have made Odessa their home, Odessans dotted the city with dozens of six-foot-tall jackrabbit statues in a citywide art project years ago. 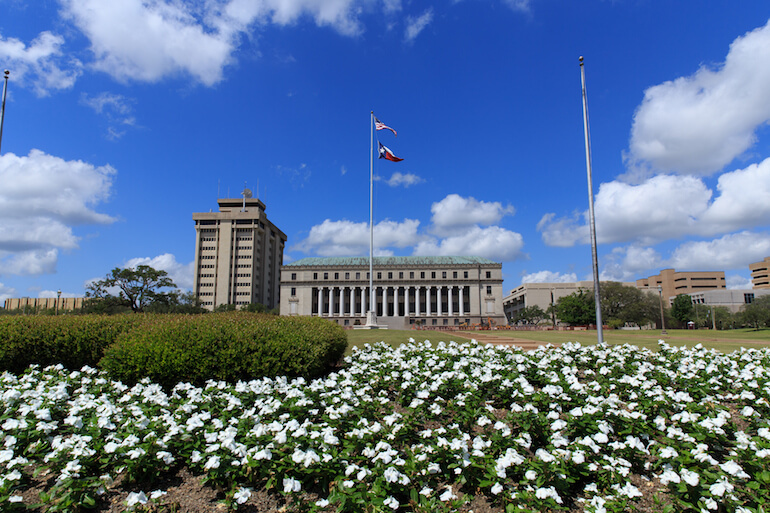 Beyond its charm factor, this city also serves as the halfway point between Fort Worth and El Paso, which, if you’re into visiting interesting sites, puts you in a great spot. Odessa also falls within the Permian Basin, which is the nation’s leading producer of oil and gas. So if you’re looking for work opportunity in a city community with a small-town feel, Odessa just might be your speed. Albany, Georgia, is good for its year-round warm weather, which is critical now that you no longer have a kid to shovel your walkway after it snows. Plus, it’s less than four miles from the Southwest Georgia Regional Airport. Between your kids’ graduations and weddings, plus the occasional weekend getaway, having an airport nearby is important. Cozy and inviting, this hip city is chock-full of wineries, bookstores, and tons of public art. Walla Walla has a strong LGBTQIA+ community, too, upping its already strong sense of neighborly love. Plus, with relatively cool weather year-round, you can say sayonara to scorching summers. 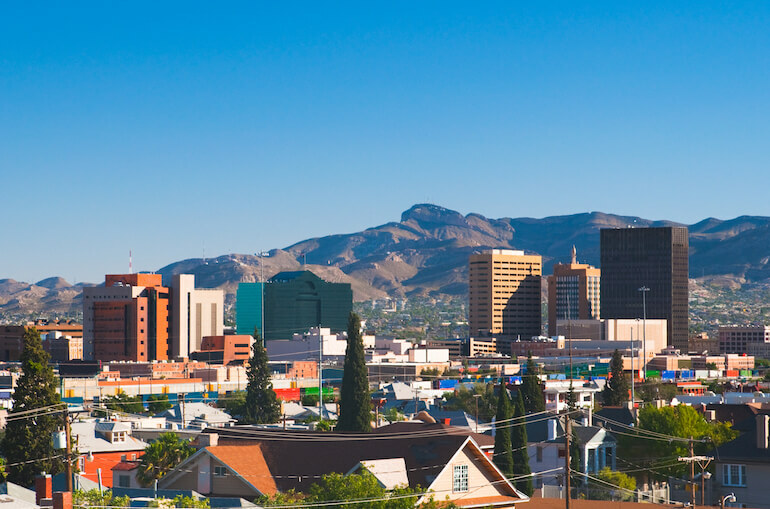 As one of the largest cities atop our list, there are many reasons El Paso, Texas, makes a great place to land. For starters, it’s extremely diverse, its winters feel like summer, and it was named the safest city in the US. Beyond all that, its median rent sits in the low 700s, which, for a population of 683,090, is pretty hard to beat. Columbus, Georgia, is an artsy town with old-fashioned appeal and a tinge of urban flair. 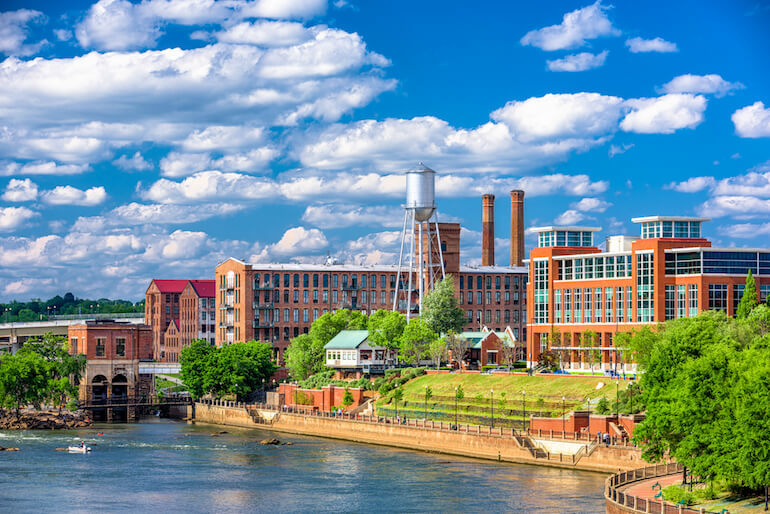 Downtown, you can kayak, raft, or walk along the Chattahoochee River—which is lined by the city’s historic industrial-era buildings—or you can choose between food tours and art galleries to keep you busy. Worried about getting to your next destination? Check out our Find-a-Mover tool and see which moving company can best help you. While you’re at it, familiarize yourself with the ins and outs of moving by giving our Moving Stats and Facts a glance. Did this article help you decide on where you want to move? Let us know in the comments section below! To determine our rankings, Move.org totaled five factors, some of which held more weight on the overall score than others. Migration (40%)—To get this number, we calculated the difference between the number of people aged fifty to sixty-five years old moving in and out of a city, divided by the number of existing households in the area with people in that age bracket. Taxes (20%)—In order to gauge a state’s level of tax- friendliness, we looked at whether or not they exclude both social security income and pension income from taxation (iI.e., iIf they tax social security benefits or not). Housing (20%)—For rent and utilities, we combined the average rent of a one-bedroom apartment with utility averages. The lower a city scored, the higher up it ranked on our list. Climate (10%)—We determined the ideal year-round average temperature to be 65°F, then ranked cities based on how close their average temperature came to that. Distance from airport (10%)—The closer a city is to a major airport is, the higher it scored.